I decided to go ahead and mention In-Laws: Married with Parents here because I think it is a highly useful, very Biblical approach to how parents and their children should be relating to one another post-marriage. I know that when Jonathan and I got married, we received absolutely no instruction on the subject of how to relate to either of our parents. We had some general ideas and some hazy-to-everyone Biblical principles to go by, but when you're both first borns and both sets of parents and you are all learning at the same time how this is supposed to work, it can prove a little exasperating at times. I wish to dear everything that we had been handed a copy of this booklet for all of us to read. It would have made a difference. There seems to be a great deal of confusion - generally speaking - as to how to implement both the "letting go" aspects involved in having a child marry as well as what it means to "leave and cleave" while still being respectful of one's parents. It seems that most newly developed relationships and new marriages that we witness struggle with various aspects of this. I really don't think there is any solid teaching on this subject. But since almost everyone is "in-lawed" in some form or fashion, it seems as if there ought to be! 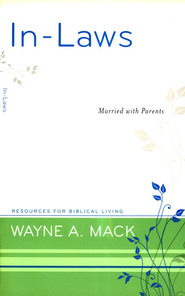 In-Laws , by William Mack, is part of the Resources for Biblical Living series put out by P&R Publishing. There are several titles in the series and you can view the list HERE. Each book is roughly 40 pages long, filled with practical advice from a Biblical perspective and gives you at least some foundation for dealing with the "issues" related to each title. The priority of the marriage relationship. What it means to leave your father and your mother. The need to develop peer relationships with parents (while still fulfilling the requirements that you respect your parents!). How to make your in-lawed relation just as much a part of your family as your blood relative. He discusses all of the above both from the perspective of the parents and the married children. In the back of the booklet he offers a short questionnaire for both the parents and the children to help them see how they are performing in fulfilling their Biblical responsibilities and requirements. I would read a book much longer than forty pages on this topic and be grateful. Right now I'm just grateful that there is someone writing anything at all about the topic! I figured I absolutely cannot be alone in this and so I'm putting this out there for you to be aware of and make use of if it sounds like something that would be of help to you. There really does need to be more teaching on this topic since, as Mack points out, so many difficulties in marriage relate to how one relates to their parents and what the in-law's involvement and attitude is as relates to their child and their child's spouse. Some focus on this subject would likely make for healthier, happier families all around. Good food for thought here! Sounds very helpful! Thanks for writing it up! This does sound very helpful. I wish there were additional books available. Our in-law relationships have been... rocky. I'm glad you posted this, we just had an interesting dialogue in Sunday School about a young man who's in-laws were not respecting boundaries etc. This book sounds like it could be a useful tool. At least a good way to start! This sounds really good, Carrie! I wish hubby and I had done some things differently back when we married at the ripe ole ages of 18 and 19!! The Lord has provided a great deal of grace and our relationships are quite good with in-laws now (although sometimes boundary lines have to be traced again), but we all made mistakes that took time and mercy to heal from. You're right, teaching on this is almost non-existent, and I'm glad there is a good booklet available on it. Sometimes as both a parent of adult children and an in-law, it's hard not to give "advice" when one feels it is really, really, needed. :-) But even as our children were becoming young adults, we tried to back off from "telling" them what to do and just offering some things to think about in their decision-making. This sounds like one I'll be interested in soon. I have liked some of Wayne Mack's other books.